This simple curry was created by my Maw-Maw and is full of memories for my mom. I think you will agree that it is a hearty and flavorful meal! 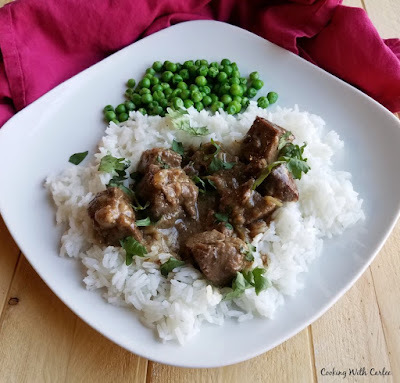 This recipe for lamb curry is super simple but so easy. It is a perfect fall or winter meal that sticks to your ribs. My Maw-Maw created this recipe way back when my my mom quickly remembered it when we were looking for old family recipes. Her fond memories were fun to relive while making the dish. 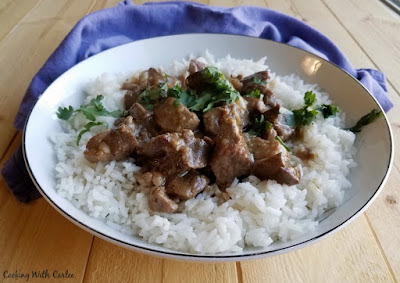 I knew as I was going back through and updating some posts that this lamb curry needed to be one that got a little attention. When I first started this project, this was one of the recipes that my mom was adamant we got from my Maw-Maw. It was something she remembered enjoying frequently during her childhood. Now we get to enjoy it too. The first time I published the recipe, it was right around Valentine's Day, so that is the explanation for the pink sweets comments. Not that pink sweets need an excuse! Holy cow! I need to detox from pink sweets! Don't get me wrong, I love pink and I love sweets. But my goodness, even this sweet tooth needs a break every once in a while! I have been looking forward to making this for a little while. I just had to find my way through all of the sprinkles. Also, I had to find some lamb. It shouldn't be that hard, but apparently grocery stores around here only carry it during the spring (though they can special order legs or chops if you can wait a few days) and the butchers I go to didn't have any in their case either. Maw-Maw uses lamb neck meant for stew in her recipe, but I had to resort to just cutting a boneless leg of lamb into stew sized pieces. I am sure the bones would have added depth to the gravy, but you have to do what you have to do sometimes! I asked Maw-Maw for this recipe specifically. I don't remember ever having it, but my mom suggested it would be a good one to make. I haven't met a curry I didn't like, so it didn't take much prodding. Maw-Maw got interested in Indian food after an Indian man who worked for Paw-Paw opened Gaylord India Restaurant in Chicago. Maw-Maw helped them by writing Americanized descriptions for the various foods on the menu. When the chicken was served it came out bright red, well cooked but still juicy and delicious. Maw-Maw thought it was lobster the first time she saw it! It was usually served with sliced sweet onions and freshly cut lemon and with a type of flatbread they called naan that also was cooked in the Tandoori ovens and was extremely light and delicious. The chicken wasn't a curry dish, but many of the accompaniments were. 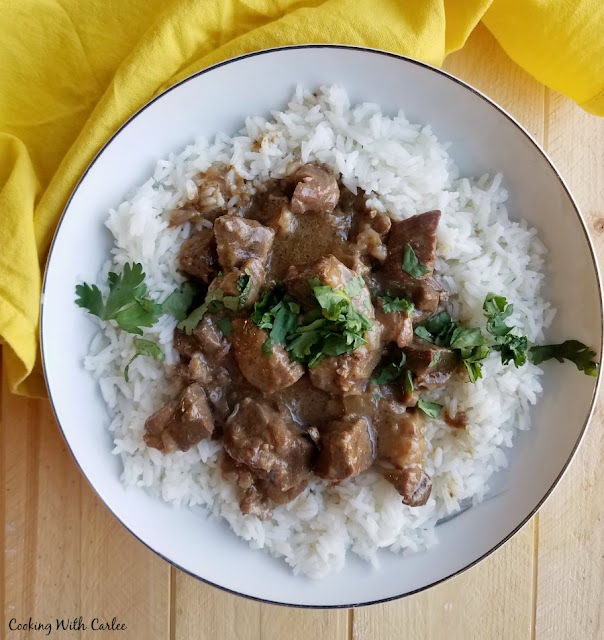 The lamb curry that Maw-Maw makes is nothing like the foods she enjoyed at Gaylord India, but it does give a little taste of curry for the American palate. So there you have it! Maw-Maw and Paw-Paw still like their Indian food. When my husband and I went to Florida to visit them a couple of years ago we went to an Indian restaurant they frequent. We had Tandoori chicken and curried lamb of all things! Maw-Maw added in her description that she normally serves this with a side of sweet peas. They also like to have sliced tomatoes and cottage cheese with this dinner. (Isn't it funny how you tend to always serve the same sides with some dinners?) I followed her advice on the peas, but chose not to do the tomatoes and cottage cheese this time of year. I will have plenty of that in July when the garden is in full swing! The other thing I am changing from Maw-Maw's version, is she cooks this for a couple of hours in a large skillet on the stove. I decided to cook it in a dutch oven in the oven. I had a lot going on and didn't want to have to worry about stirring or burning. Lazy, huh? Coat lamb pieces in flour, salt and pepper. Maw-Maw says she goes heavier on the pepper in this dish than she does in other dishes. In fact, go really heavy. This is the seasoning for the meat and all of the sauce! Heat your dutch oven or skillet over medioum-high heat on the stove. Coat with oil. Brown lamb pieces. You don't want to overcrowd the pan, so do this in batches if necessary. Once all the meat is browned, add a couple of cups of water. Stir, scraping the bottom to get all the brown bits up. Add the onions and bay leaves. Maw-Maw brings hers to a boil stovetop and then reduces to a simmer. She simmers the meat for a couple of hours. I covered and place in a 250 F oven for 3 hours. Remove meat from sauce. Discard the bay leaves and any bones. Skim fat from the liquid. If the sauce isn't thick enough, you can thicken in with a flour and water slurry. Once the sauce is the desired consistency, stir in the curry powder and return the meat. Simmer until everything is back to serving temperature. That was fun to read. When MawMaw took us to see PawPaw at work we often went to Gaylords. I loved that chicken. If I haven't given you my recipe for tandoori chicken I should. It's not red but it's really tasty. It's one of my favorite foods. (And it's not even sweet ). I love tandoori chicken, so it would be fun to try your recipe. Maybe we need to get a tandoori oven so we can make that and naan! My husband loves curry! 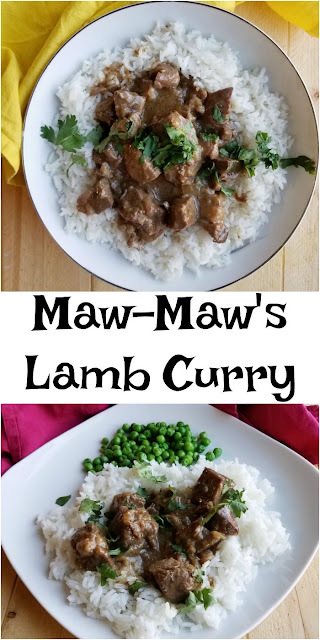 I have never cooked with lamb before but Maw Maw makes me want to try this! Looks delish! Happy weekend beautiful! I love curry too! Lamb isn't the easiest to get around here, but it is fun to have a change every once in a while. Thanks, Andrea! It's fun seeing this recipe pop up again! We definitely loved it when your MawMaw made it for us! I'm glad you served it with peas too. That's exactly how we enjoyed this meal! Peas do seem like the right thing to do! It was fun to make this again! I'm not huge on Indian food, but this does sound interesting. Maybe I will get brave and try it. Some of my family members do like Indian food. That's part of the fun of it, that we don't all like the same things. I love a good curry and now I am craving tandoori chicken after reading this again! I love the story behind this! Isn't it a fun one? It does seem a lot easier to find between St. Patrick's Day and Easter. I suppose between the Irish stew and the Easter dinners they have to stock it. Our grocer did say he could order it in during other parts of the year, but I rarely think that far ahead! Hi Carlee, I really enjoy a nice curry, but am not at all confident making it. My Mum-In Law used to make a lovely curry and she always served it with sliced banana, diced toms, coconut and a chilli chutney. I would say it was her speciality. That sounds amazing! This is definitely a simple curry but hearty and perfect for these cooler days we've been having!